I leave the USA to start my Peace Corps service in Paraguay in 3 days. I’m excited and starting to get butterflies in my stomach. Before I’m in the thick of things, I wanted to share answers to common questions people have asked about the Peace Corps and Paraguay as I’ve been saying my goodbyes. By joining the Peace Corps I’ve committed to 27 months of service in Paraguay as a community health volunteer. During the first 3 months, I will live with a host family in Asunción, the capital of Paraguay, and attend training most days during that period. The training will cover language, culture, and project-related information (in my case health). About 8 weeks into training, I’ll find out where in Paraguay I’ll be serving my 2 years (my site). I won’t know exactly what I’ll be doing until I arrive at my site because I’ll work with my site community to determine with which project(s) they would like to me help. About the size of California. Bordered by Argentina, Bolivia, and Brazil. Divided by the Paraguay River—97% of the populations lives in the east half of the country. Subtropical to temperate with grassy plains and wooded hills in the east and marshy plains and dry thorny shrubs in the west. Pretty dang hot in the summer and mostly above freezing in the winter. Mostly bilingual. 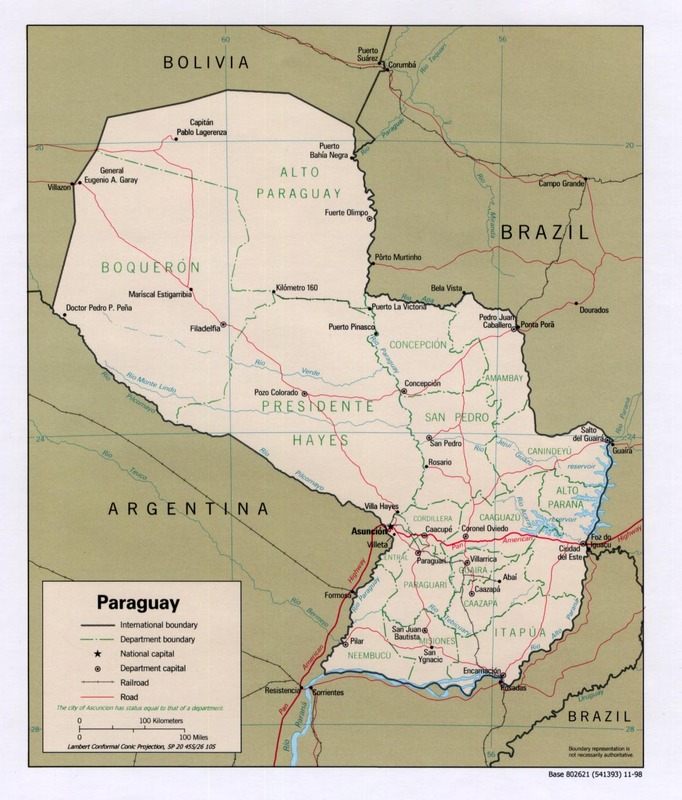 The two languages widely spoken in Paraguay are Spanish and Guaraní. 1525: Alejo García, a Portuguese explorer, discovered the region. 1537: Explorer Juan de Salazar y Espinoza established a fort on the Paraguay River, founding Asunción. 1607-1768: Jesuit missions operated and helped protect the indigenous people, the Guaraní, from Spanish brutality. 1864-1870: War of the Triple Alliance. 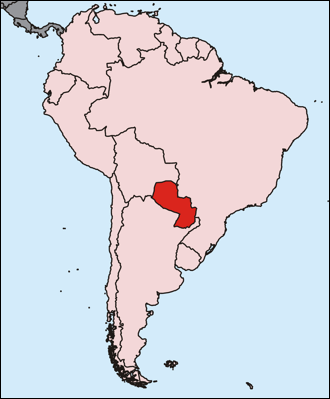 Paraguay fought against Brazil, Uruguay, and Argentina and lost upwards of 60% of its population. 1932-1935: The War of the Chaco. Paraguay fought against Bolivia. 1954-1989: Dictatorship of Alfredo Stroessner. 1989: Coup ending Stroessner’s rule and beginning a period of Colorado party presidents. 2008: Fernando Lugo was elected president whereby ending the Colorado party’s 60-year rule. There are 799 airports in Paraguay, 15 of them are paved. Paraguay’s national symbol is the lion. Paraguayans drink a lot of tereré, which is a kind of iced tea drank from a communal cup. The polka (different from the European polka) is one type of popular music in Paraguay. Some of the animals that live in Paraguay are the jaguar, maned wolf, giant anteater, armadillo, caiman, toucan, and macaw. Hebblethwaite, Margaret. Paraguay. The Globe Pequot Press. Packing for Paraguay presents an interesting puzzle. How little can I bring and still have everything I need? Thinking about what I will need to live over two years in a country I’m still learning about is daunting. But, more than anything, I just don’t want to over pack. The whole process has become a bigger existential exploration of what is necessary for me to live. The more I think about packing, the more I feel like my pile of to-be-packed things is too large and I’m approaching the whole thing the wrong way. I’m not going to outer space. I will be able to get most things. I’ve pondered, I’ve asked questions, and I’ve researched. I’ve gotten great ideas and support from current and returned Peace Corps volunteers, Peace Corps pre-departure materials, other soon-to-be volunteers preparing to leave, and friends and family. It’s hot and rainy in Paraguay. Make sure I have nice clothes. Dress in Paraguay isn’t about individualism; it’s about respect for the people around you. How “nice clothes” is defined is up for debate. I’m not going to be camping, but I’ll want camping basics. I’ll want electronics for work and connectivity, but I shouldn’t overdo it. Paraguay = high context culture, so bring pictures and gifts to help share about myself and build relationships. With departure from home 15 days away and departure from the United States 16 days away, I feel ready. I just need to repack my bags…packing most things a month early turned out to be too soon.